Dunkirk, the new World War II film from director Christopher Nolan, tells the harrowing story of the 1940 Dunkirk evacuation from three different narrative perspectives with its primary focus on the beach area where thousands of troops including British Army soldiers Tommy (Fionn Whitehead) and Alex (Harry Styles) are desperately awaiting rescue. 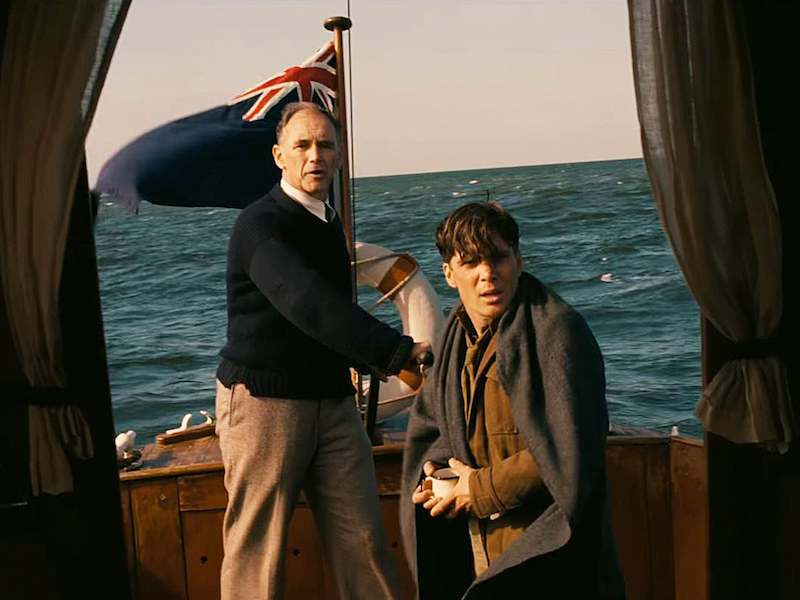 We also follow the efforts of those who volunteered to travel across the English Channel to pick up as many men as possible, including a mariner named Mr. Dawson (Mark Rylance) and his son Peter (Tom Glynn-Carney). These stories are intercut with scenes in the air featuring Royal Air Force pilot Farrier (Tom Hardy) as he shoots down German planes while also trying to conserve enough fuel to make the trip back home. This triptych structure unfolds at different rates of time (one week on land, one day at sea, one hour in the air) and is told in a non-linear fashion but unlike the tricky structures of previous efforts like Memento and Inception, Nolan doesn’t quite pull off the narrative acrobatics this time around. The stories do occasionally intersect in compelling ways — for instance, we see two instances of a downed pilot waving to his fellow airman with drastically differing contexts — but there aren’t enough of these payoffs to make the storytelling device work as well as it should. The timing of events also suggests that we should spend very little time in the air and much more on land but it felt to me that there was just as much footage of Hardy in the sky as there was following the action on the beach. The most glaring difference in storytelling from the rest of Nolan’s oeuvre lies not in how it deals with sequencing of events but rather how little background and exposition we’re given as to what’s happening moment to moment, as the director instead decides to throw us right into the action with little context. Any detail that Nolan does give, as in the breathtaking opening scene where soldiers are walking aimlessly down an empty street as propaganda papers that demonstrate their helpless situation fly through the air, often gives us situational awareness but little personal insight to the characters. Nolan’s critics have often accused him of having characters over-explaining plot points within his own films and instead of finding a more happy medium, he goes completely the other direction and gives the audience very little to go on, which is a bold artistic choice but not one that paid off completely for me. The biggest disappointment of Dunkirk is just how little dialogue Nolan, who has writing credits on all of his films excluding Insomnia, uses to not only set the scene but also to give us the character foundation necessary to be personally invested in what’s occurring on-screen. We’re barely able to learn all of the characters’ names before we’re asked to follow them into battle and we’re not given much more clarity into who these people are by the actions that they take; everyone fights for their survival and that’s about it. Again, I understand that this was a deliberate choice made for this film and I might not mind it if Nolan was a subpar screenwriter but he’s proven with his previous films that he has a great ear for clever and engaging dialogue and the decision to cut this aspect of his work out is a detriment to the final product. Despite my misgivings, I was lucky enough to experience the film in the 70 mm IMAX format and there is no denying that Nolan and his cinematographer Hoyte van Hoytema have crafted plenty of indelible and unforgettable images within this film to make it as visually immersive as possible. The sonic package, also impressive but not mixed quite as effectively as it could have been, is filled out by the blending of a meticulous sound design along with Hans Zimmer’s pulsating and characteristically bombastic musical score. Dunkirk is as technically accomplished as anything Nolan has done up to this point but by denying himself the ability to utilize his most refined skills as a storyteller, he simply leaves too much unsaid.